Yesterday, March 10th, was the first day of 2007 that I sensed spring. It is curious how it happens so suddenly and irrepressibly. I listened to music on my Radio Shack headphones during my early morning six miles through the surroundings of Indianola. While still in the tall wood not far from our house, the unmistakable song of a robin forced its way into my headset. I paused for a moment and pretended to tie my shoe strings while contemplating the degree of emotion that this fetching song has carried. The past six months have seemed a whiz and whirl with a dull varnish of melancholy and certainly a fog of denial. With my previous garden contested in the press and a virtual minefield of bruised egos, the wish to visit her was something I simply dismissed as unpalatable at best, impossible at worst. Yet that was in late summer and then autumn and winter when the mellowing year diminishes the sharpness of foliage and flower, dilutes the greens and deflates the anticipation of what is next to come. Today, when I heard the first robin sing, I was again transported to Heronswood, to the woodland garden to that moment when the table is set and the feast is about to commence. 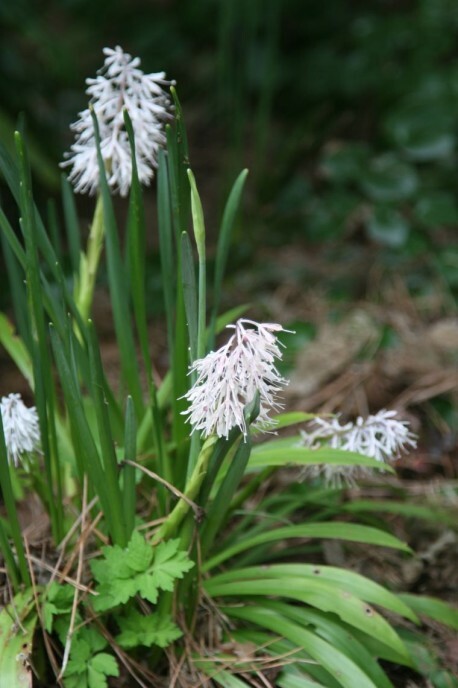 If I recall properly, I would see Ypsilandra thibetica beginning to blossom along the driveway. It is a superb plant, with erect feathery racemes of white emerging from rosettes of glossy green foliage. Steve Hootman collected this in Eastern Sichuan numerous years ago and kindly shared a piece with us. I have never seen it in the wild though I long to someday. Other than plump buds of ferns and perennials rupturing the surface of the soil in this bed, there was very little else to draw the eye, if I remember correctly. It was rather dull at this time of the year. Wait, that’s not true. Arisaema amurense var. peninsulae should already be emerging from the wet soils here, its leaves and flowers unfolding in a manner suggesting a large butterfly, still moist and unfurled, just emerging from its chrysalis. I collected it in South Korea in 1993, on Ulleong Island in the Japanese Sea. The mother plant grew in mucky soil and it seemed odd to me then that this was its preferred habitat. At Heronswood, it was the earliest of the Arisaemas to emerge, all but for Arisaema nepenthoides in a bed further to the west. The latter would force through the soil and expand its spathe in late January. I collected that species in E. Nepal in 1995. 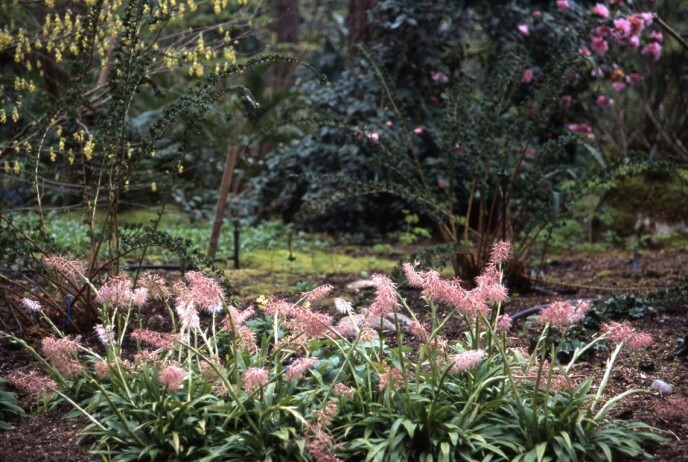 In another bed, not far from the Ypsilandra was a lovely Raununculus species that I had found in the Sierra Madre of Mexico in 1994. We never propagated it as it did not lend itself to the techniques we knew, nor did I know its proper name. The foliage was marbled in silver and it offered a tight clumping nature with pretty sprays of soft yellow flowers in early spring. I hope it is still there and has not been grubbed out mistakenly as a weed, as it appears rather suspiciously thug-like and undistinguished in the summer. In these lean days of late winter, however, it is quite beautiful. Most of the specimens of Daphne bholua, at least the older ones, had outlived their natural lifespan and declined by the time we left the garden. Alive on Monday, dead on Tuesday, so it goes with Daphnes. Those still alive would, at this time of year, fill a garden with a diaphanous, ethereal fountain of perfume. I have planted my own specimens at Windcliff, near the windows that open from our bath. They are in blossom as I write this and may still be alive tomorrow. Pachysandra axillaries is in blossom now too, in two locatons at Heronswood. 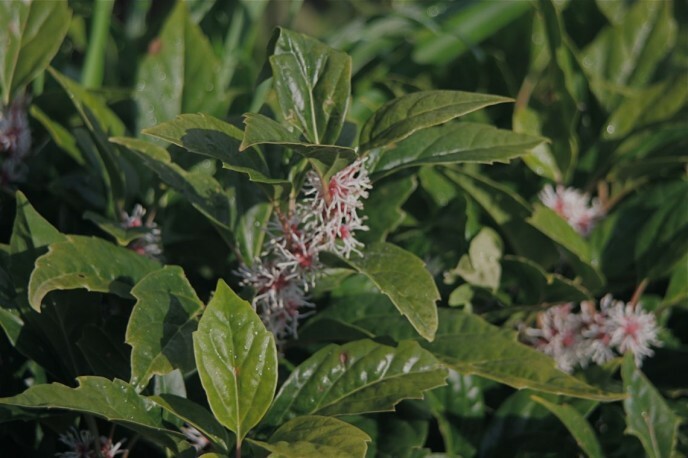 It is in the same family as Sarcococca, or the winter box. It does not take a rocket scientist to realize that intense winter fragrance is the driver of pollination by insects, much like the smell of a dark French roast on a winter Sunday morning when the floor is cold to the feet. On a cool but sunny March day, the Pachysandra would have been smothered with honey bees. I collected this species on the border of Sichuan and Yunnan in 1999 with my comrade Bleddyn Wynn Jones. 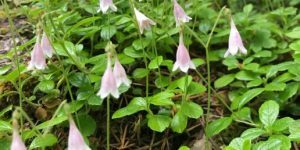 Though that collection germinated and thrived, the fragrance of my collection did not come close to rivaling that of the clone shared with me years earlier by Gary Koller, then of the Arnold Arboretum. Half way through my run, blended with the music of Counting Crows, I heard the sole and rather pathetic first croak of a spring peeper warming his vocal chords for the nights performance. It is also the first I have heard from this harbinger, a true nod that winter is slipping out the back door. I remember back to an early March evening in 1989. We had several students from my classes at Edmonds Community College for dinner that night, as a pre-trip opportunity to get to know one another better. In two days we would be leaving for a trip to Japan together to visit nurseries and gardens. That night as we said farewell at the door, there was a deafening pulse of frogs from the pond not far from the house. There is no greater sound that can be so easily distilled into the very essence of spring. By the end of my run, I had indeed visited Heronswood once again, and returned home to my new garden realizing that as long as my faculties remain intact, that physical presence in our gardens is not a prerequisite to survey the beds, enjoy the fragrances or hear the sounds of spaces we have created in our lives. She welcomed me back and I was deeply grateful for the opportunity. I was also reminded to be more cognizant of those moments occurring in real time in my new garden. These too may someday sustain me when the brittle days of late begin to seep with spring and I can no longer be here.